Have again been traveling etc. Shall close this diary today, & it will as it stands serve as a diary of events leading up to the war. We have apparently been in a state of war since 11 am. this morning. 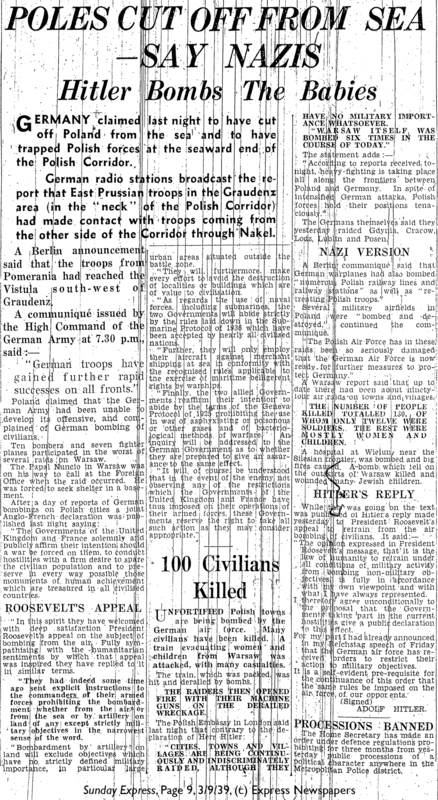 No reply was received from the German gov.t to the demand to evacuate Polish territory. The Italian gov.t made some kind of last-minute appeal for a conference to settle differences peacefully, which made some of the papers as late as this morning show a faint doubt as to whether war would actually break out. Daladier made grateful reference to the “noble effort” of Italy which may be taken as meaning that Italy’s neutrality is to be respected. No definite news yet as to what military operations are actually taking place. The Germans have taken Danzig & are attacking the corridor from 4 points north & south. Otherwise only the usual claims & counterclaims about air-raids, numbers of aeroplanes shot down etc. 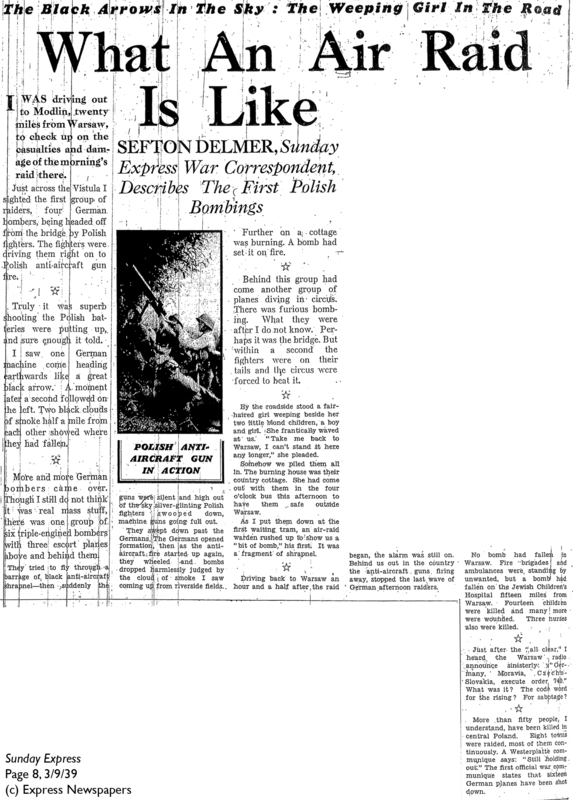 From reports in Sunday Express [a] & elsewhere it seems clear that the first attempted raid on Warsaw failed to get as far as the town itself. It is rumoured that there is already a British force in France. Bodies of troops with full kits constantly leaving from Waterloo, but not in enormous numbers at any one moment. Air-raid practice this morning immediately after the proclamation of state of war. Seems to have gone off satisfactorily though believed by many people to be real raid. There are now great numbers of public air-raid shelters, though most of them will take another day or two to complete. Gasmasks° being handed out free, & the public appears to take them seriously. Voluntary fire-brigades etc. all active & look quite efficient. Police from now on wear steel helmets. No panic, on the other hand no enthusiasm, & in fact not much interest. Balloon barrage completely covers London & would evidently make low-flying quite impossible. Black-out at nights fairly complete but they are instituting very stringent penalties for infringement. Evacuation involving 3 m. people (over 1 m. from London alone) going on rapidly. Train service somewhat disorganized in consequence. Churchill & Eden are coming into the cabinet. Labour are refusing office for the time being. Labour MPs. in the house make violent protestations of loyalty but tone of the left press very sour as they evidently realize the wind has been taken out of their sails. Controversy about the Russo-German pact continues to some extent. All the letters printed in Reynolds’s [b] extol the pact but have shifted the emphasis from this being a “peace move” to its being a self-protecting move by U.S.S.R. “Action” of 2.9.3.9. still agitating against the war. No atrocity stories or violent propaganda posters as yet. M[ilitary].T[raining]. Act extended to all men between 18-41. It is however clear that they do not as yet want large numbers of men but are passing the act in order to be able to pick on anyone they choose, & for purpose of later enforcing industrial conscription. This entry was posted in Leading Up to War, Political and tagged aeroplanes, air-raid practice, air-raids, balloon barrage, Chruchill, Daladier, Danzig, Eden, evacuation, gas masks, Italy, labour, letters to Reynolds, Military Training Act, Nazi-Soviet non-aggression pact, not much enthusiasm, POland, Polish corridor, public air-raid shelters, raid on Warsaw, start of war, troops, voluntary fire brigades, Waterloo. Bookmark the permalink. So that’s it, Eric? You stop at the start of it all? Say it ain’t so. Frank: it ain’t so. Eric is closing this particular diary, but he will begin another. There’s info on the “About” page in the sidebar; we’ve got another three years’ worth of entries to look forward to. “We have apparently been in a state of war since 11 am. this morning.” I love that after such an effort to keep in touch with developments, Eric missed the actual declaration of war. “No atrocity stories or violent propaganda posters…”, insert Orwellian pause, “…as yet.” In someone’s mind, it would seem, violent propaganda is an inevitability. I’ve been following these diaries since he sailed for Africa. The blase interval, counting eggs and whatnot, has paid off in spades and I am very much looking forward to the next installments. I don’t mean to be thick, but who ‘stood by’ — other than the whole world besides the Brits, the Poles, the Czechs, and the French? Who is this lingering resentment aimed at? No resentment. Just fact. Spain, Russia (for now), Sweden, Italy (till it saw which way the wind was blowing). Perhaps Steve can think of a few more. Poor old Chamberlain has been denigrated, but at least he did not wait for Britain to be attacked. He is not my favourite politician, but give the poor old bugger some credit for acting, however late in the day. Not really, I was just curious. Thanks for the added color. it’s a good story so far. one man, his farm, the world falling apart around him. btw, all these ridiculous twitter inserts are horribly ugly. Agreed. Twitter is a blight – worse than spam. He is actually building a mind-numbing, heart-stopping suspense by complete silence for what seems like days. I believe the time stamp on this comment is GMT. I’m at -6 at the moment. I share George Orwell’s Blog at least once a day on Twitter and a couple of other network thingies. I like meeting people here. Trackbacks have been around a lot longer and serve the same purpose, only back the other way. Pingback: 3rdBlog from the….. » Blog Archive » Remain Calm…..
Today, 04 September 1939, is a Monday. But the twitter whatchamacallits recently started showing up for some reason, and they’re not doing us here any good. Is there some way to make them not appear? I am in full agreement in that the trackbacks break the smooth, rhythmic repartee somewhat. I am adventurous, however: I go see the blog from which the trackback emanates. [Mine is a big let-down, so spare yourself, I beg of you. It’s always “under construction.”] I sent the above trackback not only to demonstrate that I know how to do it, too, but maybe to find another Time Traveler looking to hop on board to 1939 Britain. Maybe you could put duct tape over them. Or just hold up your hand to shield your retinas from them. WordPress does it by default; I will disable it, again, now. I won’t do it anymore.